The West Kowloon Cultural District Authority (WKCDA) seems to be taking its plans to develop a world-class cultural district in Hong Kong seriously. After appointing ex-Barbican (London) Artistic Director, Graham Sheffield as the CEO of the project in April this year, the WKCDA announced, on 23 June, the appointment of Lars Nittve as Executive Director of the district’s Museum Plus (M+). 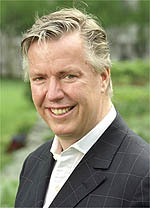 Lars Nittve was appointed as Executive Director of Museum Plus, Hong Kong in June. …more than a museum or a building space. It would be a new type of cultural institution with its mission to focus on twentieth to twenty-first century visual culture, broadly defined, from a Hong Kong perspective, the perspective of now, and with a global vision. With an open, flexible and forward looking attitude, M+ aims to inspire, delight, educate and engage the public, encourage dialogue, interaction and partnership, explore diversity and foster creativity and cross-fertilization. While WKCDA is spending substantially on hiring the best names in the market, Hong Kong art enthusiasts are worried whether their expertise will work in the localised Hong Kong art scene. At a recent press conference held by the WKCDA in Hong Kong, Nittve said that he is relying on collaborators with an in-depth knowledge of the arts scene of Hong Kong paired with his own experience in the museum field to tackle this anxiety. Nittve is a renowned museum director and curator with years of experience heading world-class institutions such as London’s Tate Modern and Stockholm’s Moderna Museet. As the first director of Tate Modern in 1998, Nittve led the development of the museum, establishing it as one of the top modern art museums in the world, drawing close to five million visitors in its first year. If I look at complications and possibilities, someone told me yesterday when I just flew in, that it’s going be more complicated than the Tate Modern. I would rather say that there are many advantages in developing M+, because actually we start from scratch more or less. In Tate Modern, we have to plug-in into a one hundred-year-old institution with its traditions, with its already existing staff, and that made it quite complicated to create a museum, that soon turned out that would be the biggest one in the family. So I think that it’s probably different, equally complicated, but in different ways. Every museum is different to start with, because every local context is different. And you have to, of course, rely on what you know, but also you have to take some leap of faith. Nittve will officially join the WKCDA team in January 2011 and will start with defining specific guidelines as to how the collection at the M+ will take shape.